I really like my indoor grow light basement setup. 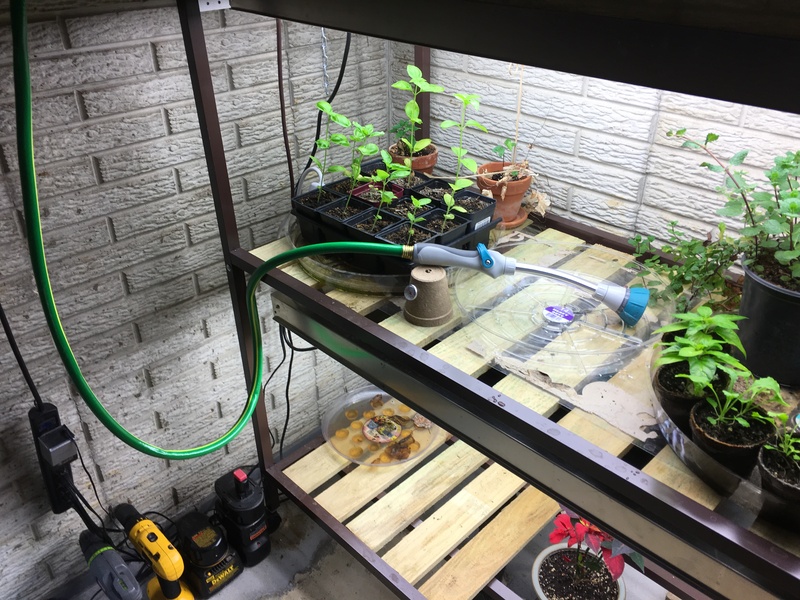 With the average first frost in the region to be around 10/19, I’ve been revisiting the setup and considering what I’m going to be keeping inside overwinter. And as I pondered the setup, I thought about how much easier things would be if I had a hose connected down there. And as it just so happens, it’s only about 10 feet away from the main water line. This portion of the basement is where the laundry machines are hooked up, as well as a utility sink. The lines split off from here, feeding two external spigots, and there’s the whole house filter, the water heater, and the general myriad of lines for sinks and bathrooms. To me, the mess of copper looks like the depths of some steampunk facility. In the chaos, the main water line passes through two spigots. The spigots are closed, with a central spigot which bypasses them–open. It looks like a setup for a water softener. I don’t know if one was ever installed, because the water here doesn’t need conditioning, but maybe it once did. Who knows? Regardless their intended purpose, it gave me an idea–could I just simply connect a hose to one of those spigots? As it turns out, no. The threads were much too wide for a standard garden hose. But surely there’s an adapter, right? Armed with this logic, I was off to Lowe’s to look at copper fittings. I quickly discovered that the maximum copper fitting size was 1 inch. Recalling how wide the spigot was, I gambled and bought a 1 inch to 3/4 inch reducer. I hurried home to see the fruition of my project, but soon determined that 1 inch was too small. 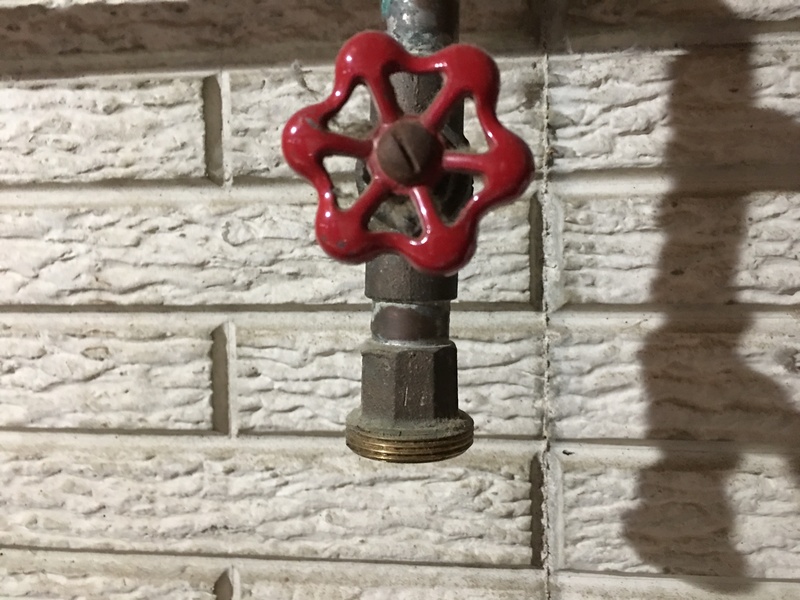 Curious, why would they not make a copper fitting big enough to fit a copper spigot? So I went to Home Depot instead. But I ran into the same problem here. None of the connectors were big enough. Staring blankly at the wall of copper, a store employee took pity on me and offered to help. I explained my plight, and he informed me that they don’t carry anything in copper bigger than one inch, but he could get me the needed size connectors in PVC. I really wanted copper, but this project wasn’t for any high-impact application, so as long as it would work at all, I could live with PVC. So, with two PVC adapters and a brass threaded hose connector, I headed back home. I then attempted to attach the PVC to the spigot, and…it was too big. What the hell? I went up one standard size from one inch: 1-1/4. Why wouldn’t that fit? And it was only slightly too big, like 1/16 of an inch. 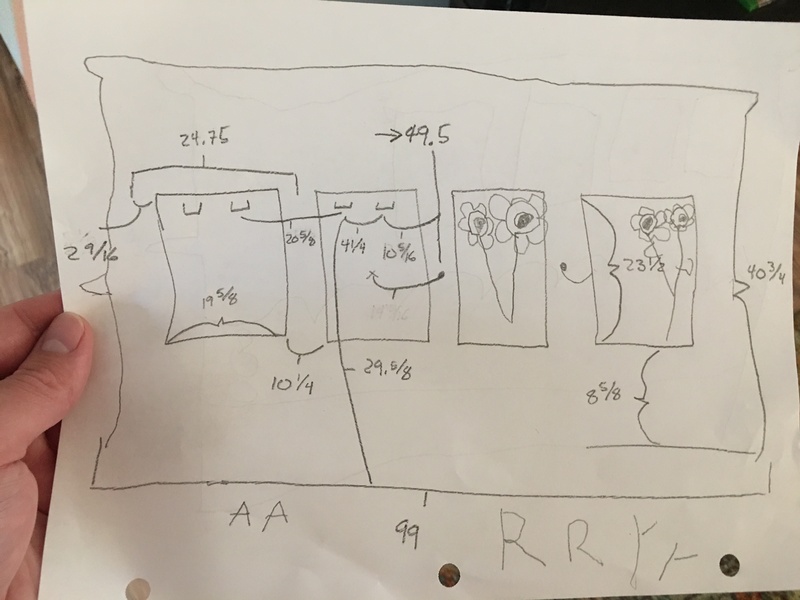 Was this spigot metric? I stewed over this dilemma, and concluded that I would experiment. So I wrapped the threads in a bunch of Teflon tape to fill the gap, cranked the PVC down, and filled the resultant void (due to the depth of the PVC threads) with a waterproofing adhesive. I let it cure for 24 hours. Maybe that would be sufficient. It wasn’t. Even though I didn’t turn the water on very high, it was still the main water line, and the pressure was too great. The joint failed with a pop and I had to scurry over and shut the spigot. Curses. Okay, experiment 2. I removed all the adhesive and Teflon. This time, I was armed with self-fusing silicone tape–something designed to seal high-pressure pipes (which I bought on a whim while I was returning the first batch of connectors). I wrapped the spigot threads with enough tape that it became an effort to crank down the PVC connector. This stuff was supposed to adhere to any surface and be completely waterproof. I let it sit for a bit, but it didn’t have any cure time so that hardly seemed to matter. This time, I decided to test it without any sealant, since the sealant itself wouldn’t hold the pressure anyway. I turned the water on, higher than I had turned it on with my last attempts. And…it held. Huh, maybe this silicone tape is magic after all. I let the hose stay pressurized for a time, then shut it off and de-pressurized the line. I refilled the gap with sealant, figuring it might still help by adding support. And so far, it’s working as I had hoped. I’m uncertain of this solution’s permanence, and somewhat unhappy with the inelegant and hacked solution, but time will tell. And if it doesn’t hold up, then I’ll simply splice into the wash machine line instead. I know I can get proper connectors for that at least. Still, the irritation lingered, and I searched for an explanation. Curiously, pipe fittings are not nearly as standard as I had thought, and the actual measurements are approximations which have changed over time. 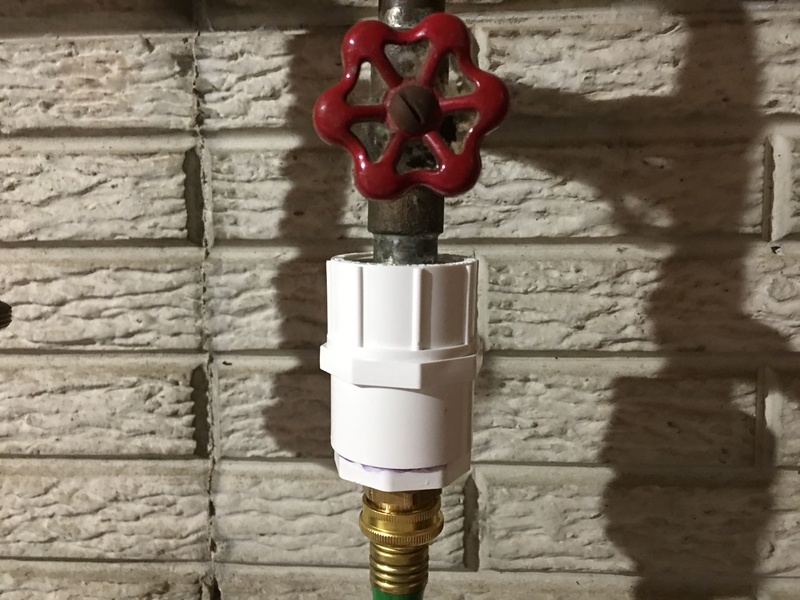 So whenever this spigot was installed, for whatever connection it was intended, is no longer a current standard. Sheesh. Maybe one day I’ll try soldering in a nice ball valve threaded for a garden hose, but for now, I don’t want to risk compromising the main water line and having to call in a professional. Why the hell aren’t pipes all standard sizes? Another homeowner lesson. I thought some bladed weaponry would look good above the mantle. Dad thought some full-size babe pinups would fit the space perfectly. But ultimately, I somehow ended up with sunflowers. I suppose pictures of the reproductive parts of plants is sort of like pictures of babes…roll that disturbing thought through your brain a bit. Admittedly, I like sunflowers. I wish I had grown some this year. 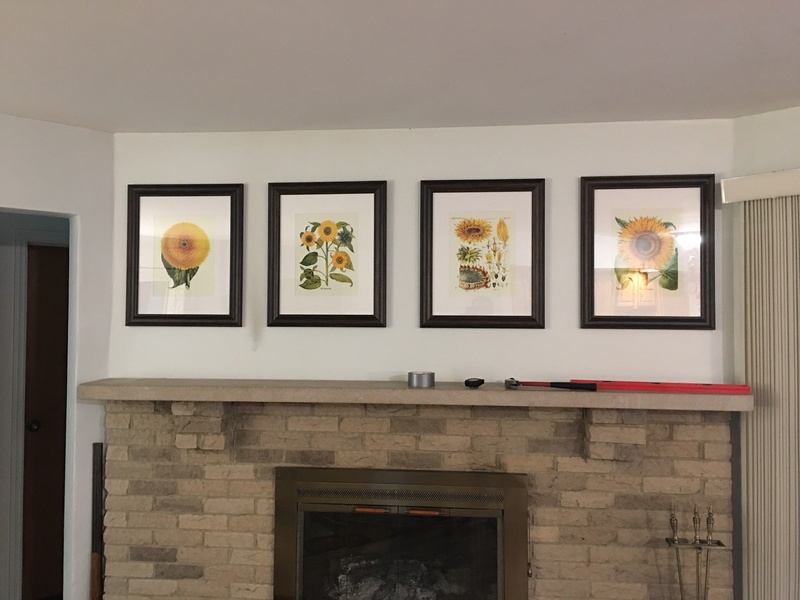 And I had been living in fear that the mantle would eventually be adorned with paintings of cabins in the woods, so I can live with sunflowers. But it’s a lengthy stretch–99 inches to be exact, and Liz had acquired 4 individual pictures. This would create a ratio that would show every slight deviation in alignment, so they had to be mounted with exacting perfection. Fortunately, OCD can be leveraged to accomplish such perfection, so out came my tool kit and the drafting equipment (paper and pencil). At least the frames were light so I didn’t have to worry about mounts or studs. Studs are never where they’re needed, and mounts always seem to have a 50/50 chance of ripping the drywall out. As more pumpkins ripened, the kid asked to help with the harvesting. Naturally I was happy that she wanted to help, and smiled as she donned her gardening gloves. The vines have a lot of prickers on them, and freeing the fruit requires the use of shears. It was then that I lamented on what has become of the fall activity of picking one’s own pumpkin from a patch. Given the equipment required for the task, it occurred to me that picking pumpkins can be both (a) slightly uncomfortable, and (b) slightly hazardous. I mention this because as I look back, I realize that visiting a pumpkin patch these days typically involves driving to a field, then either selecting a pumpkin from a pile of already-picked pumpkins, or (slightly more authentic) walking through the field and selecting a pumpkin that has already been cut (and sometimes appear to have been placed there manually). Presumably, since people pay for this, they want it as comfortable as possible, and always want to achieve the height of satisfaction for the experience. It would be one thing to go slog through the field only to find a few misshapen and moldy pumpkins, but if you were to pay for it first along with the wagon ride out there, then you become an entitled paying customer (and rightfully so). And of course, there’s the usual concerns associated with sending a bunch of people out through your property with sharp objects. The culmination to these concerns, therefore, is a watered-down and unauthentic experience, devoid of any proper character-building misery that enhances the elation from a successful endeavor. Every pumpkin-picking trip is the same, and therefore never a disappointment, but also then never memorable. But I have subverted the cycle of mediocrity in this one very specific instance. The patch might have only been comprised of 3 plants, but it was real. She’ll remember this. 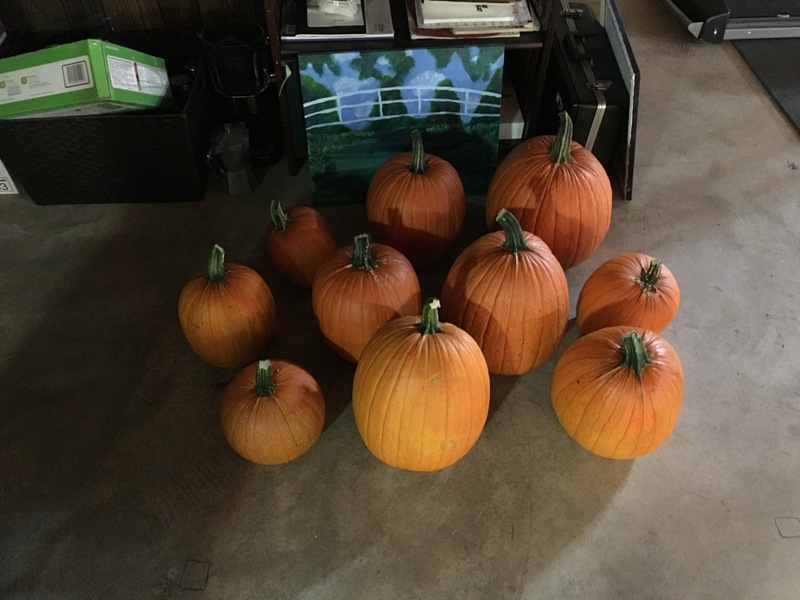 Plus, I got 10 pumpkins, which retail for $5 each–for a plant that volunteered and required no effort to cultivate. Sticking it to the man, in this case the evil corporate pumpkin racket. Dawn broke. With a deep breath, I analyzed the the thick morning air. I sampled its nuances, sensing the fear. Wildlife everywhere trembled in anticipation of the hunt to come. I rose, eager for the stalk. I’d like to say that’s how the day began, but I’ve never been a morning person. When I was a child, it was my sister who woke me for Saturday morning cartoons. High school fared no better, as evening extracurricular activities intruded upon homework and leisure time, and in turn brought about a later bed time, which naturally led to morning routine difficulties. In college, I worked after class, often closing the department at 10PM. After college, I worked second shift for years. 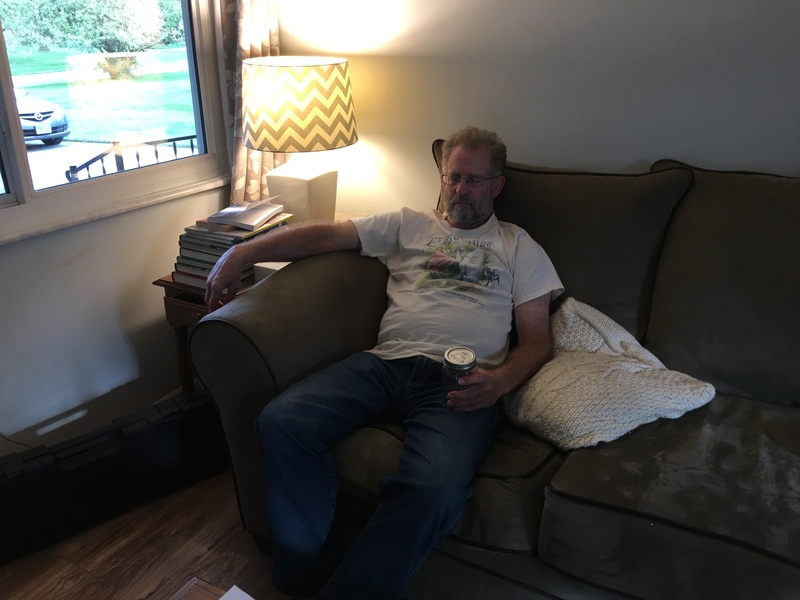 It is only recently that I began working normal hours, but the actions of a lifetime have driven deep habitual behavior, and I find my body very unwilling to change its customs now. Instead, the alarm went off at my usual 6AM, whereupon I followed a standard routine to deliver the kid to school. Then, after brewing a pot of coffee and loading the hunting gear into dad’s car, the ruthless caveman hunters that we were began our journey in the comforts of a climate controlled sedan. I admit–modern hunting is definitely a privileged man’s sport, a far cry from its beginnings as a survival activity, and certainly a pretty pathetic claim at representing the planet’s apex predator. Our destination was the Clark Lake Wilderness Area. In years prior, we had struggled to find bountiful hunting grounds, and out of sheer chance, I had discovered this little alcove. It was obviously set aside for one purpose–hunting. It’s very design made this implication clear, having landscaping engineered to match the natural habitat of indigenous prey. But more importantly, it was the only place we had tried in this region that had netted results. So it was an easy decision to make. 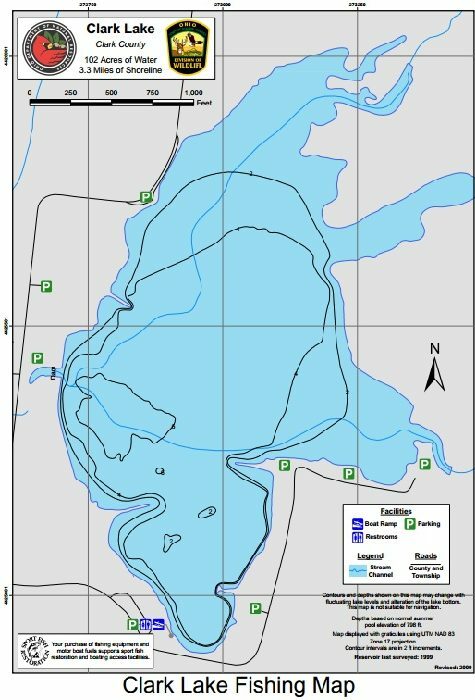 The road terminates in a parking lot on the eastern side of the lake, and this is where the large wooded lot resides. However, if you look on the map above, the parking lot just west of that is in a clearing, and in that clearing is an isolated grouping of 3 trees. The last time we hunted here, on the way out of the woods, with no kill to our bag yet, I saw squirrels in those trees. 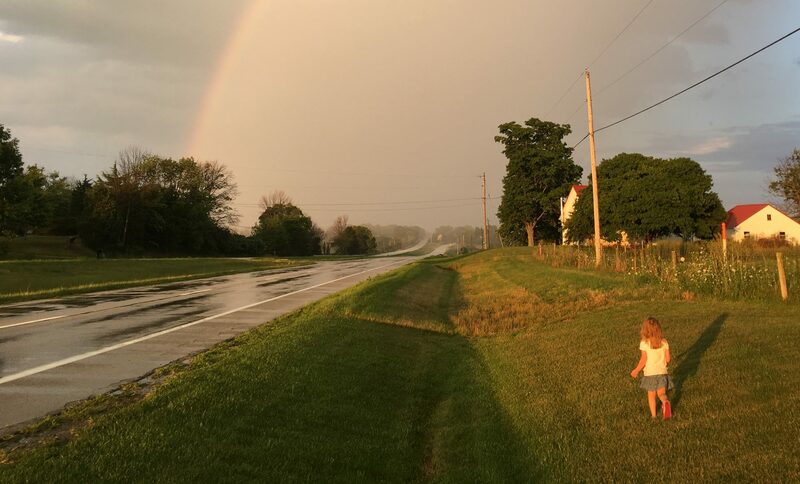 At the time, I had yelled at dad to stop the car, and I leapt from it (while it was still moving) with my 20 gauge and ran across the clearing to get in range. 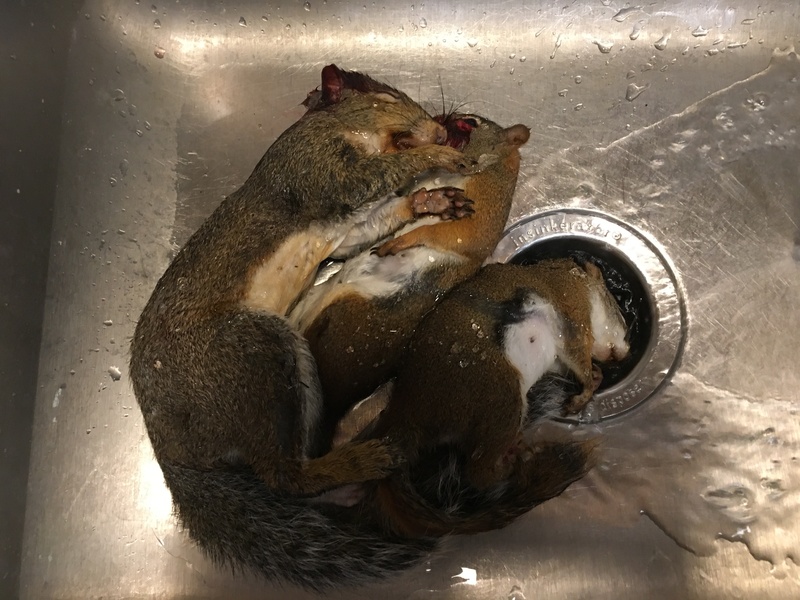 I managed to drop two squirrels with my single shot shotgun. So this time, as we made our way back upon the old road, dad joked about that time prior, and suggested we check there first. He immediately spotted 3 squirrels. I, being unsurprisingly less agile than I was in years past, methodically laced my boots and donned my gear, figuring squirrels generally pay no heed to humans. Of course, this false assumption was based upon my interactions with suburban squirrels. By the time I was ready, these squirrels had vacated, save one, who scampered up a tree and hid. So we waited. Eventually, as we were giving up, I saw a flick of the tail. Perhaps it was the extensive time I’ve had with that one weapon, or perhaps it was a trained muscle reflex, or indeed it was my ruthless predatory instincts, or all of the above; but I immediately dropped the squirrel with a single shot. But the shot had missed the brain stem. The unfortunate creature twitched for a time, until dad finished it off with his knife. I winced as he pithed it. But part of why I hunt is to remind myself what’s behind the meat we so readily buy. There’s always a cost in suffering, and taking a personal hands-on approach drives this point home. Moving on, we followed a deer trail, it was my turn to jest about a second particular tree that had yielded a squirrel last time. Moments later, a red squirrel began running down that very tree. 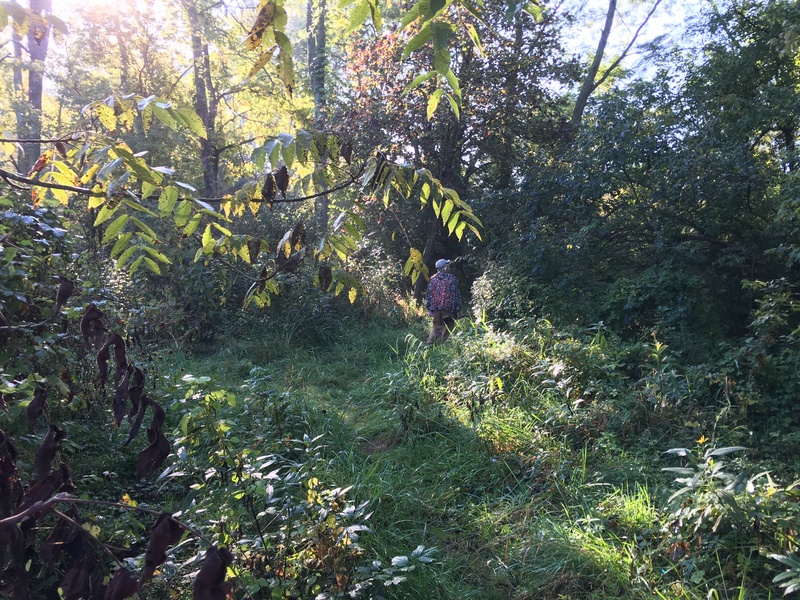 I fired as he hit a patch of twigs, so I didn’t see the impact, but he fell into the mired jungle behind, and I got thoroughly soaked from the knees down trying to retrieve him from the brush. The week’s rain and the evening dew had saturated the undergrowth. But, two squirrels we now had. We continued to the main wooded lot and split up. I note dad chose the easier path, whilst I got the jungle. Between the blackberries, the garden spiders, the water, the humidity, and the rising temperature; I found the experience trying (I later referred to it as a Vietnam simulator, to which dad thought I was being overly-dramatic). I did see another red squirrel, and I fired, but I was bogged down at the time and just slightly too slow. He got to see another day. Not long after, I heard a shot, and presumed correctly that dad had bagged a squirrel of his own. I knew from experience that he moves painfully slow through the woods, but when I tried to slow my own pace, I discovered a cloud of mosquitoes had identified me as a mobile buffet. Then I ran into another couple hunters, so there was just too much movement to hope to find anything else. I tried to find dad. Yet dad, despite the orange vest, always proves elusive, and I had to resort to modern technology. But it’s not every day that someone sends a text to rendezvous at the dry stream bed. Here’s another reason I hunt–the joy of practicing land navigation skills. Whilst traversing wilderness, it behooves the adventurer to remember enough features so as to find the way back (sans-smartphone). Thankfully, I’m still good enough at it that I knew immediately where he was. And sure enough, he had a squirrel. One’s a success, three’s a bounty. Dirty and sweaty, we left for home. And I’ll note that dad jumped in the shower right away, leaving me to do the cleaning. But like the killing, it serves as a reminder. Eating meat is a privilege, and requires a lot of unpleasantness first. Squirrel reminds me of a really mild pork, and as woodland squirrels subsist on nuts and fruit, are probably of a much higher quality than anything store-bought. 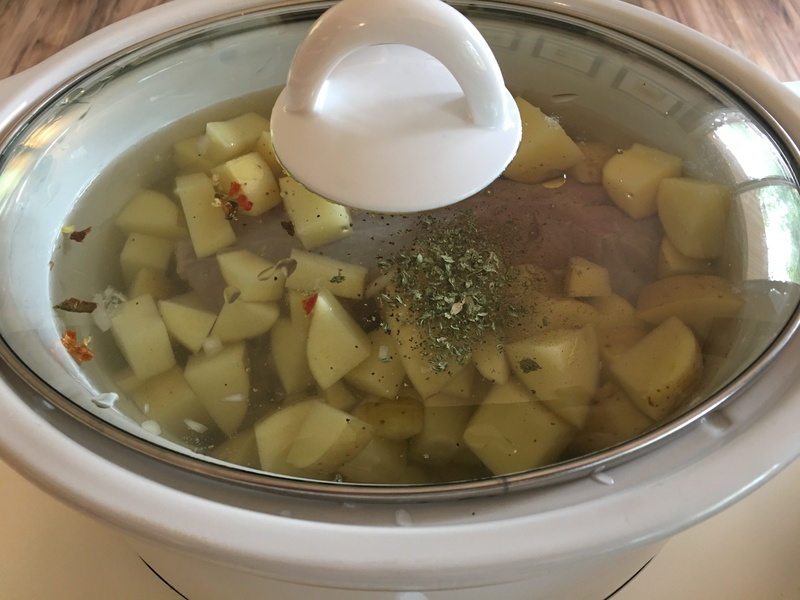 A few hours in the crockpot yielded a tasty stew. Even the kid ate it. Liz–not so much. Her culinary curiosities apparently have their limits, and eating tree-rat was beyond them. Some celebratory bourbon and the old man was out. Each time we hunt, I tell him when he’s old and useless I’ll just shoot him in the woods. But I think the kid still needs her grandpa, so I’ll keep him around a little longer. That, and then who would I go hunting with? Next up, it’s wabbit season.